SCP is currently stored in a safe storage locker in Site-X, locked with an electronic keypad. Access may be granted with authorization by Level 3 personnel. At this time, SCP may not be requisitioned for any outside aid purposes. 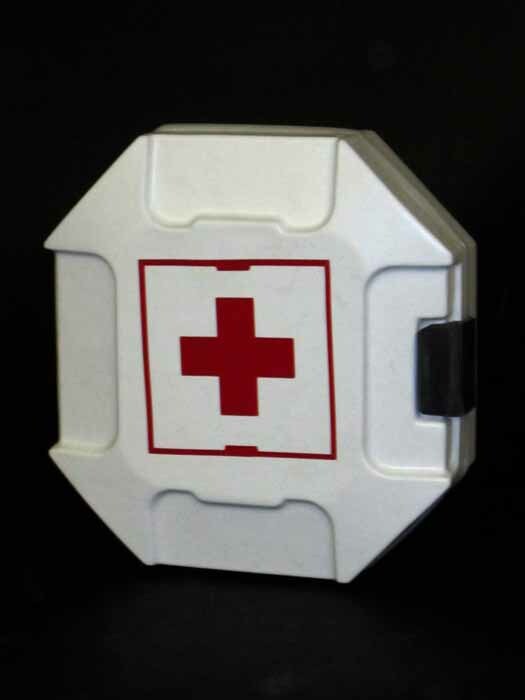 SCP appears to be a customized First Aid kit. When opened, a handle is visible. Pulling on the handle produces some canvas attached to a length of pvc. Continued extraction will eventually produce a large medical tent with a red cross on the front and sides. Within the tent is a fully stocked, fully staffed mobile aid station. The tent (SCP-1) is canvas supported by poles. The interior measures WxDxH, and contains a number of modern medical devices and a full supply of chemicals and medicines commonly used in hospitals. A compliment of seven medically trained personnel (SCP-2) appear to reside in SCP-1. Upon erection of SCP-1, SCP-2-1 through -4 will open the tent and proceed to set up a fully functional mobile aid station, while SCP-2-5 through -7 will survey the area and assist in any emergency rescue and aid attempts. If no emergency is present, they will locate the nearest person and inquire about providing medical aid. If their assistance is not needed, they remain near SCP-1 and appear confused and uncomfortable. SCP-2 appear to possess incredible knowledge and talent in nearly all medical procedures. Using only the contents of SCP-1 they have been known to perform a number of complex operations including stitches, blood transfusions, amputations, and in one case, an organ transplant. While SCP-2 have been described as empathetic and pleasant, they appear ignorant of anything that does not involve medicine, including their own existence. All attempts to question them have resulted in confusion on their part and no new information. The one exception being their parent organization. When asked who they work for, they will uniformly reply that they represent the Manna Charitable Foundation. Upon close inspection, a crease is evident near the base of SCP-1. Pressure applied to the crease causes the SCP-1 to begin to fold. When compression begins, SCP-2 will close the entrance to SCP-1, which will effortlessly fold back into SCP. If patients are currently in SCP-1, compression will not proceed past the initial buckle. SCP was discovered by Foundation personnel imbedded in the Red Cross during emergency aid procedures following an earthquake in CA. Agent observed abnormally complex procedures being performed by SCP-2. Upon asking for their affiliation, they gave their listed reply of the Manna Charitable Foundation, a name Agent was not familiar with. Following a hunch, Agent closely observed SCP-2. When the operation closed up at the end of the day, Agent observed SCP-2 entering SCP-1, and a civilian folding the tent back into SCP. Agent swiftly apprehended the civilian and contacted the Foundation. The civilian, who at the time was working with a known aid foundation, claimed to have gotten SCP as a donation from the Manna Charitable Foundation as his organization was mobilizing for the disaster. Upon confirmation of his story, he and his associates were administered Class B amnesiacs, along with all who had direct contact with SCP. All who had indirect with SCP were given Class C amnesiacs.